Sold on Dealer Lot $107k Ram 2500 Pickup! Not A Joke, True Story! Oh Facebook, you bring out the best … worst… stories sometimes. Like this one. A post went up with pictures of a $107k Ram 2500 pickup. Yes, $107,000. Not a typo. Alright, officially it is only $106,992, but really who is concerned with $8 once you exceed $100k. This guy isn’t apparently. The Ready for SEMA pickup looks pretty damn cool TBH. However, we aren’t sure about that $40,888 dealer installed package. That’s a lot of dough. 25For the record, this isn’t a new thing and dealers have been modding pickups for a long time. In fact, we stopped by a Nissan Titan dealer just a few months ago and captured his story (check out our video). He came from a domestic brand and learned how to jack up … err… modify pickups to bring in more profit. 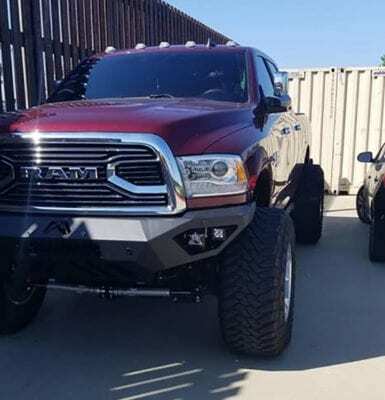 Assuredly, there is a LOT of profit in this $107k Ram 2500 pickup. The dealer really scored, but did the buyer? The buyer does get all the mods done, keeps the vehicle’s warranty and drives off the lots without the hassle/fun of modifying the pickup himself. What do you think? Worth it or no? Next articleQOTD: $70k For 2018 Ford F-150 Power Stroke 3.0L Diesel – Would You Buy It? Could The 2016 Nissan Titan XD PRO-4X Be A Ram Power Wagon Competitor?